Daulatabad – City of Fortune, Labyrinth, Moats & Bastions! The fort has 3 walls. 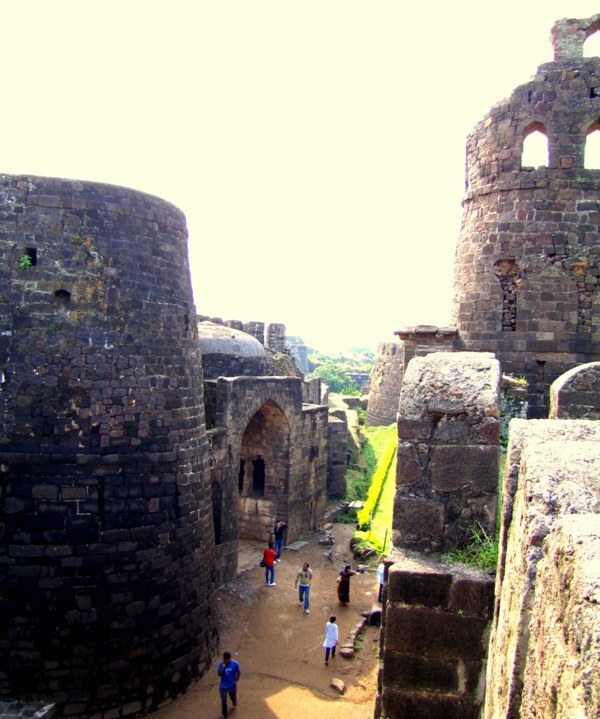 Amberkot an outer wall which covers the Daulatabad town, the Mahakot wall encloses the Daulatabad fort. This wall had spear-like structures slotted into them which could even leave hoards of charging elephant useless. Lastly the Kalakot, the final fortification resembles the shape of a beer bottle and is built around the huge rock hill. Kalakot is surrounded by a deep moat which is said to have been filled with crocodiles and poisonous snakes. This fort has many underground tunnels, some as long as 70 kms. They were designed and drilled that helped the Sultans escape. They were said to be connected to the Rajur town and many other places still unknown to us. Crocodile and poisonous snake infested moats were made with several drawbridges. As soon as the enemy stepped on these bridges, they were unhooked throwing the rival into the moat. This maze is a piece of exceptional strategic architecture. Archers would hide themselves in deep cut caves in the ceiling, so if torches were lit by enemies, they would be targeted. The tunnels are so deceptive that if the parties split in two and met head-on to fight amongst themselves due to the darkness. After all the trickery, if they got out alive, boiling oil was poured from above, killing them instantly. The everlasting trap the fort has crafted is stunning! The labyrinth, moats, bastions and scheme of the whole fortification is splendid! One of the best-preserved medieval forts in the world, it has a saga of numerous tales of splendor, betrayal, blood-shed. I have heard that the Devgiri fort was so well fortified that it was called as ‘ajinkya’ – that cannot be conquered. This fort was conquered by the invaders from across the Sindhu river after a fierce battle by the son-in-law of king Ramdev Yadav, Harpal (some believe that he surrendered without a fight). He was skinned alive and hanged on the outskirts of the Devgiri province. I am surprised how come there is no mention of this. I really feel sad when only a certain part of history is projected and not the entire picture. Bipin: Yes you are right. A lot of history is missing. Read the book by Qureshi Dulari. A lot of inside stories are mentioned there. With my write-up, I just wanted to concentrate on the defense mechanisms, something unique and stunning! Not sure if the last comment went through since my explorer crashed on me … Anyways … Nice pictures esp the one of the spiked gate. Makarand: Went through your post. The video does a lot of justice to your explanation. MAgiceye: Thank you…you’ve been a great supporter! Madhu: Didn’t get your comment earlier. Thank you so much! !